Did they modify your action any to use the AW mag?? My Mcree works great with the Mcree AICS pattern mag and AICS mags but was wondering if i would have to modify my action to use the AW mag. No modifications at all. I sent the rifle for installation of the bottom metal into my McMillan and pillar bedding. He made a minute change to the mag well (of his bottom metal) and it worked fine. The he stuck an AICS 5 rounder into the rifle, and it worked too! Sweet deal for 4.275 actions. It's a monster. The rounds below are loaded to an OAL of 3.625"; you can see how much room there is to spare. Just ran into this old thread. Great info. Thanks for taking the time to get the measurements! Does anyone know if a .260rem will feed reliably out of a AICS 300WM magazine? Understanding there will have to modifications to the feed lips. My concern/question is will the mag/feed lips hold the .260 in long enough to feed reliably? If anyone has had success with this, some pics would be greatly appreciated! I understand that one of the advantages of the AI AW .308 is, that you can top load your additional rounds through the action into the AW magazine without having to take the magazine out. I guess with the AE or AICS .308 magazine that is not an option. My question: If I have a Stiller, Templar, APA, SAC, or BlackOps Precision action, cut to accept AW magazines, will I be able to top load rounds through the action without taking the magazine out? Some of the actions with an integrated rail seem to have a small ejection port. Any shared experience with this and the used bottom metal will be greatly appreciated. Sorta a followup on Svendogg's question. How about a 308 from the AICS 300WM? If the lips can be modified for the 30-06, the 308 seems like it should work but does the length create feeding issues? So i have a question. I just bought a used AI AE MKiii. The receiver is stamped AE MKiii but i noticed from looking at the pics in the beginning of this forum, that the mag i have for the gun is a AICS magazine. And the magwell looks like an AICS or AW. In new to this whole AI stuff and trying to learn. Is this a common thing to have a receiver marked AE but it accepts AICS mags? Should i be worried? Nothing to worry about. When Accuracy International upgraded their platform from the AI AE MK 1 to AI AE MK 11 they designed the new mag for that rifle, which is what you have in your possession. All these after market bottom metal you see for Remmy's and such use the AICS mag, because it's a proven performer. The mag you have was made for your rifle, nothing to worry about. Enjoy shooting the heck out of it. Almost forgot. Welcome to the AI club. Yes, you will be able to top load. It's the true double stack design of the mags that allows for top loading, not the action. AICS mags are staggered single feed so they cannot be. It's like an AR mag vs a double stack pistol mags in how you load them. Thank you very much. Took of these counter snipe rings that came with it and waiting for my larue lt-104 mount to come in. Then back to sighting in. My first 308 so i got to stock up on some ammo. Just picked up some hornady 178gr BTHP match superformance. Is there any real advantage to the single feed (AICS) mag to the double (AIAW)? From what I can tell the shorter height of the AW and ability to load rounds directly into the magazine while in the receiver lends to the AW being better. Anyone know the score with the nex AICS AX chassis, will it take AW or AX magazines as well or only AICS mags? It will accept AIAX, AICS and AIAW mags. Does anyone know the internal dimmensions on the new AX magazines? What is the max OAL to load rounds to? Sorry, I meant the AX308 mags; I saw the earlier post for the AX338. Just so I'm clear on AICS COAL lengths (as I'm getting different answers on different sites) the 5rd AI mags have a COAL of 2.90 and the 10rd AI mags only offer a COAL of 2.86 or 2.88? Can someone clarify for me. 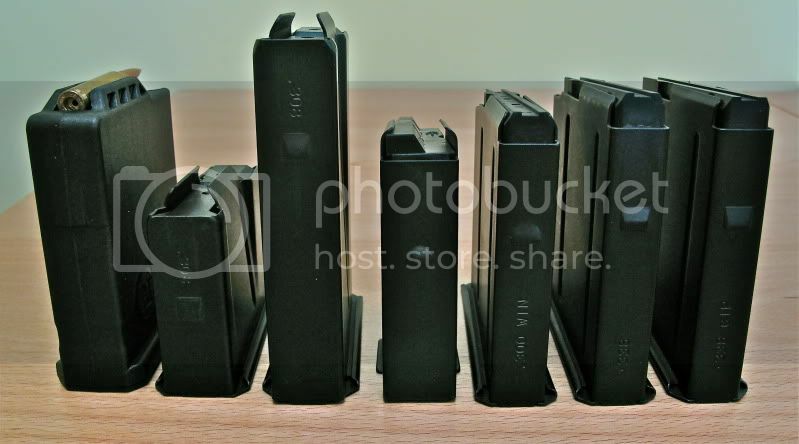 I just measured the 5 and 10 rnd AICS mags. I got a measurement of 2.890 on both mags. AW magazine with Lapua 6x47 and 105 hybrids seated long (2.78"). BTW, I can get 11 rounds in the AW magazines and still enough space to press them down for the bolt. Anyone with an AI PSR, whats the max C.O.A.L. that can be loaded into the .300WM magazine? Anyone with any info on the PSR .300WM magazine dimensions? The AICS 5 rnd magazine will fit the JAE 700 stock, but does anyone know if the AICS 10 rnd double stack will fit it as well? I didn't think it would but wanted to know if anyone has used this by making a mod or if it will take. Yes, but AICS has a double stack 10 also. If any AICS will fit, they will both fit. The AICS goes over to a double stack eventually, but starts off single stack and then slowely tapers open. The AW magazine is a true double stack from start to finish; hence it is quite a bit shorter than the AICS 10rd magazine. So I've been doing a lot of searching and reading about my issue - but I just recently got the XLR Element chassis and a 10rd AICS mag for my .308. It's very difficult to chamber rounds when the mag is loaded to capacity, usually the first 5-6 rounds are extremely difficult, and the remaining 5 aren't as bad. I've read about some people modifying their magazines and others that recommend against it - so is there any chance that the feedlips will "break in" and not be so tight? The problem is that the feedlips are so tight that they are marring the brass quite a bit, but functionally they aren't allowing the cartridge to angle upwards into the chamber when it hits the feed ramp because the lips seem too long. This causes the extreme difficulty in chambering, and subsequently blunts the tip of my A-max's and sometimes shaves off a bit of them as well. Just got my AT and still adding to rifle but was loading 10 rd mag and noticed it wanted to accept more then 10..
Is this normal? Or do I just be careful to only load 10? I know the AW mags will take 11 and still have some spring. You could stick 12 in there, but will not be able to put in the mag with the bolt closed. I would only put in 10, you'll be sure they all feed properly. I just ordered an AT which I know uses AW mags... While I plan on purchasing many more AW mags I already have quite a few AICS mags, can I use them in the AT? Will they feed reliably? I know the AT has a dual feed ramp so I don't know if that'll be an issues with the center feed AICS mags. As my luck would have it, I have AW mags and they obviously will not fit up to a Model 700 action With a Surgeon Bottom Metal as the feed lips are too long. Are there any options on modifing them? Great info and pictures. Thank you. FYI, in order to get plenty of OAL on my 7WSM build, I opted to use a LA Rem700 and .338 Lapua AICS mags. The case body diameter is similar between the 7WSM and .338LM, and the rifle feeds perfectly. I'm seating the 195gr Berger at 3.170". WOW, I cant believe this post will be turning 10 this year! i'm glad it has been a valuable resource and very glad it continued as a continuously updated thread. I'm glad the hide has migrated back o a stand alone site. look forward to spending more time here again! Good to see you back ROLEX. I enjoyed all the pics and trivia you posted over the years. Great info with all your posts. Seeing as how this thread has already been revived, I have a question. I have a 6 Creedmoor with a Tempest action running the AW magazine. It holds 11 rounds, still has travel left over, is no where near magazine length. But sometimes the bolt fails to pick up a round. Maybe 1 out of 15 or 20. It looks like the magazine fails to lift the base of the round high enough for the bolt. I've played with the follower thinking maybe it was hanging up, but it's very smooth, never hangs. Not sure what's causing it. I have a tikka ctr 6.5 creedmore in a MDT HS3 chassis it came with a MDT llastic magazine.I need another type magazine so I can load longer rounds.What are my options as for as what will fit and work in this chassis and allow me to load longer bullet. Thanks for any help Rick.